Does looks matter? This is a question that we all face at some point in time. When our priorities change in life, often looks take a back seat and by the time we again consider it important, it is beyond repair! Not that I m fat … a little overweight! But that indeed did affect my self esteem! It was the time I have achieved some control over my mind through Art of Living. Yet my looks continued to dominate my body. Whoever says size does not matter? When the size has to do your own body, it does matter!! At some point in time I started trying to get back my previous body! I tried a lot of things to get it back.. But phew, nothing worked! One day Art Of Living announced Yogathon…. with a challenge to do 108 Surya Namaskaar… Well, I can be obstinate when I am convinced of something. I readily took up the challenge! I don’t have to write here about my weight … But the change that made in me…what I am today, I was not yesterday! Along with Surya namaskaar, I been doing very regular with Sudarshan Kriya too… Together, they were causing some changes in me! Well, and I believe so! I started loving myself! To love one’s own self is the first thing we must do…. Yes, of course without encouraging our ego! It boosted my morale… I knew that now all what I do is not perfect … I do make mistakes … But for me. my health, my body, my spirit must remain positive and nothing should bother me…. I kept that smile…sometimes even faked when there was none .. I haven’t hurt myself or cried for so many years now! And yes I am still emotional and compassionate. 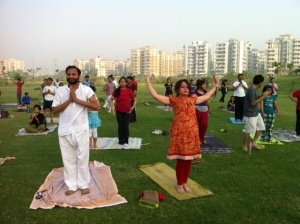 To cut it short, Surya Namaskaar takes care of body, Sudarshan Kriya takes care of soul …. When both combines it makes you a beautiful soul in a beautiful body … That’s what others see … and you feel wanted and valuable, FINALLY ! Your commitment let your beauty pop out! keep it up! you are beautiful!!! Thank u sandeepji for ur kind words & appreciation for the same … Surely it’s encouraging ! very true chhavi….rediscovering self-that’s what the journey in Art of Living so far has been all about ! Hi. I am very happy to read your blog. You sound positive and in good spirits. Sometimes it is hard to find your flow in life, I guess it is, as there is always a higher price tag for all the meaningful things in life. I am happy that you are well on your path of self-discovery. You are so beautiful! Can just Suryanamaskar and Sudarshan Kriya make one so beautiful? What else should one do? Your story is so inspiring. Keep sharing more.